In this experiment, image processing techniques are applied for the quantification of bacterial colonies in an agar plate. 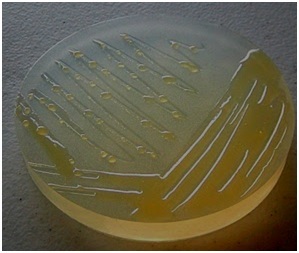 To understand the growth of a bacterial samples on an agar plate using image analysis software. Bacteria are a group of microscopic prokaryotic organisms belonging to the kingdom Monera. They grow in large numbers everywhere and live in almost every environment on the surface of earth. Most of the bacteria reproduce by binary fission, which is an asexual mode of reproduction. The growth of bacteria can be defined as the gradual increase in the quantity of cell components, as well as the number of bacterial cells. In laboratories bacterial cells are cultured in a predetermined media under controlled conditions. Microbial cultures are used for the determination of unknown microorganisms and their abundance in the sample. It is one of the primary diagnostic methods in microbiology for the identification of causative agents of infectious disease. Bacteria and other microorganisms grow in specially prepared Petri plates containing nutrient rich media. Solid medium used for the cultivation of bacteria cells is known as bacterial agar. They form colonies in the agar which can be recovered for further work or analysis. The qualitative analysis of the bacterial culture can reveal many characteristics of cell culture. It is necessary to quantify those characteristics of culture media. There are several methods for quantitative enumeration of bacterial colonies. Quantitative analysis of these samples can be done by obtaining the snapshots of the Petri dishes at different time points and analyzing the images through image analysis software like ImageJ. ImageJ is a Java based image analysis software by the National Institute of Health (NIH, USA). If bacterial cells were cultured on an agar plate, the number of cells would increase with time. Increase in bacterial cells can be determined by looking into the area the cell colonies occupy, or the size of a specific colony.